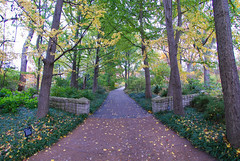 Strolling through the Missouri Botanical Garden, past the manicured grounds of the Lichtenstein Victorian District and headed towards the Japanese Garden, visitors will happen upon a shaded patch of tranquility known as the Cherbonnier English Woodland Garden. Here, beneath a canopy of trees, more than 300 rhododendrons and azaleas and 100 dogwoods burst into bloom each spring, while clusters of wildflowers, hydrangeas and perennials provide surprising splashes of color against the background music of a babbling brook. The English Woodland Garden has matured since 1976, when former Curator of Hardy Plants John Elsley brought the idea from his native England to the Missouri Botanical Garden and spurred its development. What started out as one-and-one-half-acres on the far south end of the Garden grounds has expanded to the present-day size of nearly three-and-one-quarter-acres. The garden exemplifies an English style noted for its informal display of botanical treasures from around the world. Like its English counterparts, the garden here has three vegetation layers. First is an upper canopy provided by trees such as oaks (Quercus sp. ), maples (Acer sp. ), ashes (Fraxinus sp.) 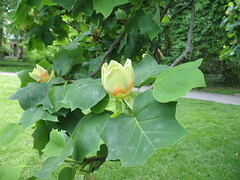 and tulip trees (Liriodendron tulipifera). Some of the most impressive specimens include Pumpkin Ash (Fraxinus profunda, formerly Fraxinus tomentosa), Swamp White Oak (Quercus bicolor) and Pin Oak (Quercus palustris). 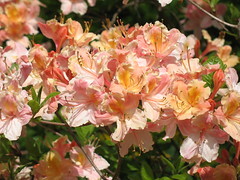 The middle layer contains smaller trees such as redbuds, fringetrees and witchhazels, as well as shrubs including hydrangeas, viburnums, beautyberries and camellias. The lower layer is filled with ferns, wildflowers, and herbaceous perennials, such as meadowrues, bishop’s hats, and foam flowers. The intent of horticulture staff is to “work in ‘garden rooms,’ with clusters of the same or similar plants to draw people from one room to the next,” according to Enkoji. The garden’s peak is around the second week of April, when the dogwoods, wildflowers and other spring blooms are out. 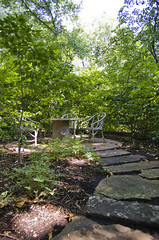 However, the overall shade of the garden promotes a sense of serenity and makes the area a popular refuge during intense St. Louis summers. It also poses a horticultural problem, as growing anything in the shade cast by the canopy of trees is a challenge. A key attraction of the English Woodland Garden is the meandering brook that flows from a pool in the northeast corner, under several limestone bridges and into the Japanese Garden lake by way of a waterfall. 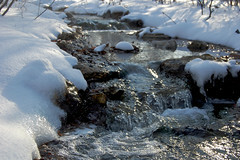 Visitors can track the stream on a winding path of stepping stones, observing the streamside plantings of primroses, ferns, cardinal flowers, and some ground orchids. Over 400 limestone boulders are carefully placed along the streambed, providing naturalistic concealment of what is actually a 220-foot concrete liner. A second water feature is a bog display of plants that thrive in wet soils or aquatic habitats. The garden features a bronze sculpture of the Three Graces by Gerhard Marcks (1889-1981). In Greek mythology, the Three Graces were lesser gods of Olympus, daughters of Zeus and Eurynome. They are pictured as beautiful and charming, and always dancing together. The sculpture was made in 1956 in memory of biology professor Dr. Thomas S. Hall of Washington University, a member of the Garden’s Board of Trustees from 1982 until 1990. The garden also features the Mary Phelan Memorial Birdbath, installed in 1999 in tribute to a popular local television news anchor who served on the Garden’s Members Board and was killed in an automobile accident. The birdbath is created from a naturally concave piece of lava rock from the Seattle, Wash. area. In 2009, three rustic concrete chairs and a table were installed atop a decorative concrete pad, creating a natural sitting area. The furniture is in memory of Adelaide G. Cherbonnier. The Tom K. Smith Gazebo was designed and built with natural materials and provides a lovely setting to take in the beauty of the woodland. The English Woodland Garden is dedicated in memory of Adelaide La Beaume Cherbonnier and Edward Cherbonnier.